Imagine having the power to summon a flame at your will with just your mind. Completely hands-free, you cause a flame to gradually, and beautifully form right in your spectator's hand, like REAL MAGIC. From our SansMinds Pro Series, we bring you just that. 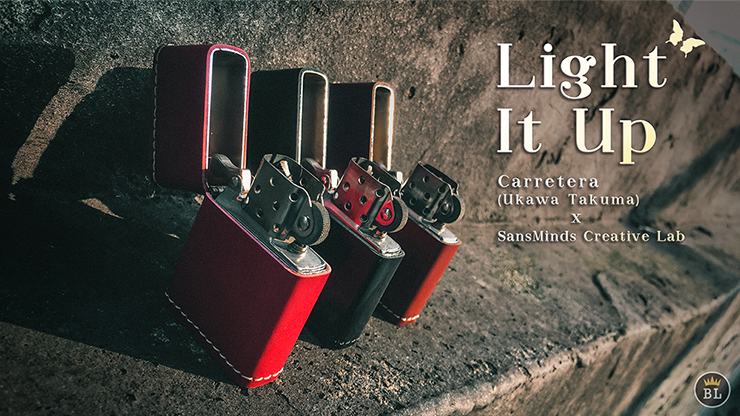 Say hello to Light It Up! A self-contained device that lights up either in your spectator's hand, or innocently resting on the table, all while your hands are free. Imagine using your supernatural ability to cause the lighter to light up on its own in a ghostly manner. Imagine adding one more magical phase before producing, vanishing, or changing an object with flash paper. You no longer need someone to hold the lighter for you. As you concentrate, the lighter sitting on the table magically lights up. And you have BOTH HANDS freed up for the necessary work. What is Light It Up? A completely self-contained secret device precisely built and hidden inside the Zippo-style lighter. The microelectronic and ingenious programs will do all the work for you so you can focus on your presentation. The lighter unit is wrapped with high quality leather. A clever secret button is built beneath the leather for you to trigger the 5- or 10-second time-delay to produce the flame. If unexpected things happen, push the button one more time to cancel the ignition. Answer: Yes, everything is built precisely with ICs to control heat, so it will not overburn on the trigger. Everything is protected in the metal casing to ensure it's 100% safe. 2. Do I have to keep buying expensive batteries? Answer: Not at all. The device is USB rechargeable for repeat use. 3. Like all fire products out there, the heating part burns out and wears off fast. Do I need to repurchase the item again if the heating part no longer works at its optimum level? Answer: The ignition device itself is designed to be easily replaced. You won't have to repurchase the entire product after eventual wear from everyday use. So... Whether you use it as a stand-alone psychic effect or go down the presentation route of making a birthday wish come true, it's a device that truly sparks imagination with endless possibilities. Get yours NOW while supplies last.